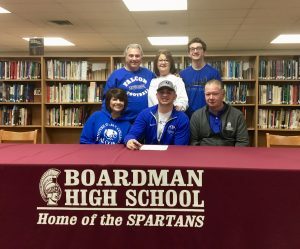 Congratulations to senior football player Alex Huzicka as he signed his National Letter of Intent to continue his academic and athletic career at Notre Dame College in Ohio. He was a two-way starter for the Spartans as a defensive end and tight end. In his senior year, he earned 1st Team All AAC honors and 1st Team All Inland District Northeast as a defensive lineman. Alex was also named 3rd Team All-State and broke the school record for tackles for losses with 33 tackles this year. As a junior, Alex earned 1st Team All Inland District Northeast honors and Honorable Mention All-State recognition. Alex is the son of Jeff and Monica Huzicka and will study business at Notre Dame College. He received offers from Notre Dame College, Mount Saint Joseph, Charleston, Tiffin, Findlay, Lake Erie, and Clarion.